We are specialists showing in Jewish Heritage and connecting Jewish travelers with local communities. The first wave of Jews who came to Colombia were from Jamaica and Curacao. Years later Sephardies came from Greece, Turkey, North Africa and Syria. Once that Judaism was a legal religion recognized, the government granted land for a Jewish cemetery. Soon after, Jewish immigrants began arriving from Eastern Europe. A wave of Ashkenazi immigrants arrived after Hitler took office in 1933. From 1939 until the end of World War II immigration was suspended. The Jewish population grew greatly in the 50s and 60s, when several institutions such as synagogues, schools and social clubs throughout the largest cities in the country were established. 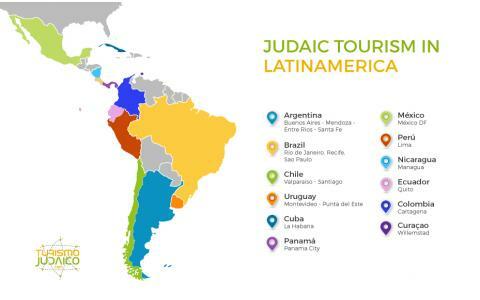 At present, most of the Jews are concentrated in Bogot� Colombia, with about 5,000 members. There are small communities in Cali, Barranquilla and Medellin. The size of the population of Ashkenazi and Sephardi is almost equal. There are nine synagogues across the country. An organization, Confederation of Jewish Associations of Colombia, located in Bogot�, is the main organization that centralize all Jews and Jewish institutions in Colombia. Colombia is a constitutionally organized as a decentralized unitary republic tropical country. It consists of 32 departments and one capital district: Bogot� D.C.
Its� area is 2,070,408 km2, of which 1,141,748 km2 correspond to its mainland (30,845,231 hectares are indigenous territories) and the remaining 928,660 km2 to its maritime extension. Colombia is the only South American country with coastlines on the Pacific Ocean and the Caribbean Sea, which has several islands and the archipelago of San Andres and Providencia. Colombia is known worldwide for producing smooth coffee, flowers, emeralds, coal and oil, its cultural diversity and for being the second of the richest countries in biodiversity in the world. The country has about 45 million inhabitants.